Und der COLONIE VORGEBIRG DERGUTEN HOFFNUNG. By Adam Christian Gaspari in. "Allgemeiner Hand Atlas Der Ganzen Erde". 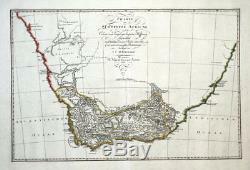 A fine original large format copper engraved map of South Africa and the Cape of Good Hope. 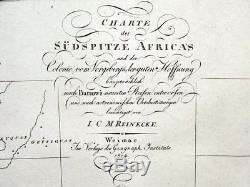 The Cape Colony is shown under early 19th century Dutch rule. A lovely old map, enhanced with original hand colour which remains bright and fresh. The heavy grade hand laid paper remains robust and stable. 23.5" x 15.5" (590mm x 390mm) map area only, with good margins beyond. Please see also close up images. A GENUINE ANTIQUE MAP GUARANTEED OVER 200 YEARS OLD FROM LINDISFARNE PRINTS. We do not deal in reproductions, facsimiles or modern copies of any kind. 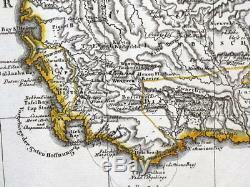 The item "SOUTH AFRICA Gaspari original hand coloured antique map 1804" is in sale since Saturday, September 22, 2018. 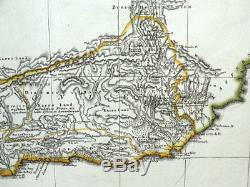 This item is in the category "Antiques\Maps, Atlases & Globes\Asia Maps". The seller is "lindisfarne2" and is located in Shrewsbury. This item can be shipped worldwide.